Captain Klaus and his team are happy to call for project proposals for the Nomadic Village 2014. For the 4th Village we are inviting nomadic artists to south-east Austria to set up the Nomadic Village with their mobile homes/ateliers and realise their projects. 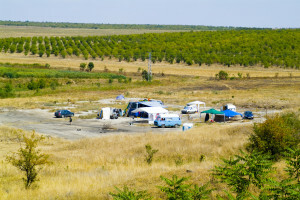 The Nomadic Village is a 2-week settlement set up on a vacant lot close to an existing village. The nomadic artists’ mobile homes/ateliers form the structure of the Village around On The Road Productions’ (ORP) Steyr-Ikarus bus, which acts as its townhall. In this autonomous environment, participants can freely experiment with new ways of working; it stimulates creativity and exchange, and attracts local people to observe and participate in the process. At the end of the Village there is a public exhibition/show that invites a wider audience to appreciate the works produced during the Village. The project is the brainchild of Captain Klaus, lead Artist and founder, from ORP/Austria. We are seeking to invite artists from all over the world whose works look at themes of nomadism; artists who in their practice respond to and interact with places and people; artists who intentionally displace themselves to seek encounters that not only influence their work but form it; artists who create situations. number of rather unusual ‘homes’. The Nomadic Village will be set up on an inspiring location close to a village. The exact location will be published in March. • All meals provided, dinners cooked by our chef, other meals provided on a DIY base. • Facilities – including electricity, toilets, running water, wifi. • Contact to the local community. • Basic equipement and help for resourcing materials locally. • Letters of invitation and other support to enable you to raise additional funds. live and work in. To apply please send us a description of the project you would like to realise at the Nomadic Village, an artist bio/statement and CV. Include supporting material/documentation of previous work, either attached to email or send us web links. Make sure we get an idea about who you are, your artistic practice, who is involved and what kind of mobile structure you will travel/work/live in. Let us know if for some reason you can’t come with your own vehicle; we might be able to provide you with a space. The Nomadic Village provides the site, infrastructure and food but does not pay for artists coming to the Village. However, if your travel costs are especially high, e.g. if you are coming with a big diesel hungry truck, you can apply to the Dizel Grant (see below). before submitting an application – just for an informal chat, remember the deadline for submissions is Monday 24th February, 2014 – so make sure you leave enough time to contact us. Applicants will be informed about the final selection by 3rd of March. The Dizel Grant is an uncomplicated small grant to enable nomadic artists’ travel to the Village 2014 with diesel- or petrol-hungry mobile ateliers. After the public presentation in the Village, a selection of the artists’ work will be curated into a group exhibition. The bus will then hit the road, serving as a mobile gallery across Europe. It will travel to remote areas such as small villages and rural locations, as well as to cities and art centres. For more info & photos, visit the Nomadic Village website.